Central Valley Masters held their Scratch Open the weekend of May 19-20 at AMF Southwest Lanes that drew top scratch bowlers from CA and AZ. A total of 101 bowlers were going for the $5,000 top prize. The field was cut to the 20 who returned on Sunday morning and then they were cut to 5. The final match between Jakob Butturff and Anthony Thompson was something to see with Butturff edging out Thompson 266 to 244! Central Valley Masters would like to thank their sponsors DV8, Robb’s Pro Shop, Carlie Medina III and Zack Long. They would also like to thank the CVM members who gave up three days for this event. Special thanks to Lisa Isbell and Nico Storm for helping as well. And, thank you to the staff at AMF Southwest Lanes. Event paid out $16,305 in prize money. They had (196) brackets paying out $7,075. And they paid out $1,435 in side pots. The bowlers were appreciative of CVM and this event. “You guys are awesome! Thank you so much for everything you do!! – Anthony Thompson. 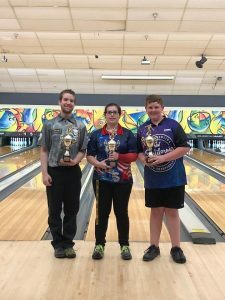 Their next tournament is coming up in June on Sat., June 16th is the Central Valley Masters Trios Tournament which takes place at Rancho Bowl in Santa Maria. Squad times are 10am & 2pm. Team entry fee is $180. Bowlers bowl four games across 8 lanes. This is a handicapped tournament (80% of 220), beat the board with $1,800 guaranteed for 1st place! Payout is 1 in 6 teams. Brackets and Side Pots are available. For further information, go to www.centralvalleymasters.com. The annual CUSBC State Convention will soon take place up north in Fresno the weekend of June 9-10. Delegates from associations all across the state will be attending. This will be the 12th annual CUSBC Convention. Activities for the weekend include a CUSBC Youth Committee meeting on Sat. at 10am which is for all Youth Delegates and Youth Members. At 1pm on Sat. there will be a USBC Jamboree conducted by David Prange, USBC Western Regional Manager who will be discussing the many changes of USBC. Prange will be joined by Tracy Ebarb of the International Bowling Museum and Hall of Fame. Saturday evening will be the Awards Banquet where they will be honoring Hall of Fame inductees and recognizing Manager of the Year, Coach of the Year – Chris Preble, and State Youth Scholarship winners – and our very own, David Waybright is one of them! They also will present the top three associations who raised the most funds for BVL as well as associations who raised $2 or more per member – and Golden Empire USBC will be recognized as we raised $3.28 per member!! Golden Empire USBC will be represented by President Ray Neubig, along with Directors Bette Addington, David Waybright and Amber Waybright. Youth bowlers interested in joining a league this summer, mark your calendars for Sat., June 9th. That’s the first day of league that will bowl for 10 weeks at the cost of $100. League will be at noon on Saturdays and teams will be trios. If interested, please contact AMF Southwest Lanes at 661/834-2695. West Side Lanes inside West Side Recreation & Park District in Taft will be having an Adult Summer Doubles League that bowls on Mondays starting June 25 through August 13. League fees will be $10 per team plus $5 per week per person (or free with Recreation Center Membership). League meeting will be held on Mon., Jun. 25 at 6pm in the Party Room (league will bowl at 6:30pm). If interested, stop by the West Side Recreation & Park District located at 500 Cascade Place – Bldg. D in Taft or call them at 661/765-6677. 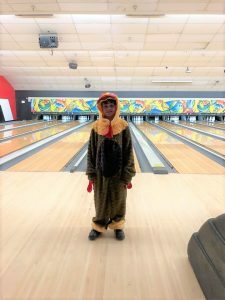 On May 20th the local bowling community lost Gene Crawley. Gene was 85. An Air Force Veteran, he was known to league bowlers at Regency Lanes for years and bowled up until just recently. – Congratulations to Mary Jane Brust on receiving her 35-Year Participation plaque when she competed in the 2018 CUSBC State Women’s Tournament the weekend of May 19-20 at Keystone Lanes in Norwalk. 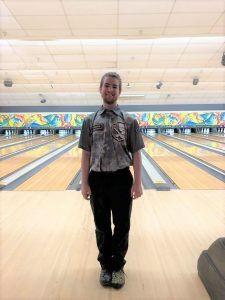 – Congratulations x 2 to Zack Newman on his recent 300 game roll, 4 within a month at this point, with the most recent one rolled this past Thursday night, May 24th, bowling in Robb’s Ball league at AMF Southwest Lanes! 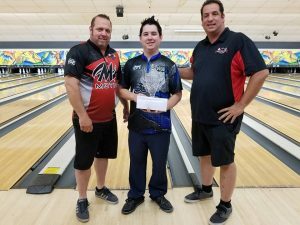 – Congratulations to Dan Long for making the cut this past weekend at the PBA Vanessa Brown Homes West, held at Yosemite Lanes in Modesto. Long also bowled in the Pro-Am held on Friday night. Long ended up placing 11th. Sat., Jun. 2: Mt. Mesa Lanes No Tap Tournament, 2pm & 6pm, bowl 4 games throw out your lowest, limited spots available. For info, call 760/379-3131. Sat., Jun. 9: First day of Youth Summer league at AMF Southwest Lanes, 12 noon. Handicap Singles: 1. Lynn Bender (943); 2. Dunisha Wright (891); 3. John Curtis (886); 4. Alex Garcia (874). 3-6-9 pot was finally hit by Dunisha Wright!! Alex would like to thank his faithful helper, LaDonna Helton, for always being there!